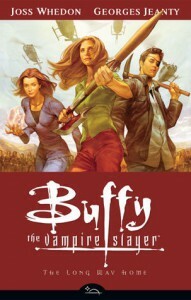 I'm not going to try to sound all scholarly or like an actual reviewer up in here; Buffy the Vampire Slayer: Season Eight is like crack-laced popcorn to me, and it's impossible for me to be objective. The original teevee series meant a lot to me, and Season Eight feels like an extension of that series -- same cleverness, familiar characters, Monster-of-the-Week style subplots with a Major Big Bad hovering over it all -- and I can't help but love it. I don't know if non-fans would think as highly of it -- maybe having the characters' voices and mannerisms in my head already is an advantage? -- but I finished the first five TPBs in one night, and would have kept going if my library owned the others in the series.